"Our mission is to make the nation safer, and to keep the nation safe." The Honorable Jay Cohen kicks off the plenary session of the DHS S&T Stakeholders' Conference by describing his four "Gets" (Get people, financial books, organization and content right) and now six "B's": Bombs, Borders, Bugs, Business, Bodies and Buildings. "It's all about product to help our first responders!" "Our adversary is very patient and focused. Will we have done enough to make -- and keep -- the nation safe?" 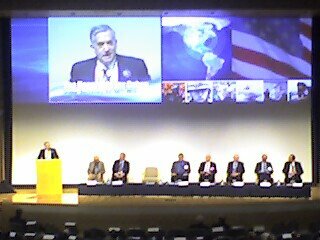 The panelists seated to Admiral Cohen's left are representatives from the National Labs, including Associate Lab Directors ("VP" equivalents) from Oak Ridge, Savannah River, Sandia, Brookhaven and Los Alamos -- plus the Lab Director from Pacific Northwest.